I got this months Julep Maven “It Girl” Box right at the beginning of March, and I’m kind of embarrassed to admit that I’m finally swatching them. I got the email about my April box and realized that I never even tried a single March polish. I have to say, I’m really disappointed with this months box. It seems to be a trend that every month I get 3 colors and then 1 or 2 freebies. December, I got nail polish strip appliques, 1 polish, a pot of nail glitter (there’s my 3 polishes I guess), orange stick and nail file for the strips, and a top coat. January, I got 3 colors, a base coat and nail polish remover. But the last 2 months, my freebies were awful! I didn’t blog about February but my freebie that month was a mini bar of chocolate. This month I received the normal 3 polishes and then my “freebie” this month was an emery board nail file. Emery board nail files are awful for your nails! They rip and tear the tips to file down your nails and actually lead to more breaks. If you want stronger and more break-resistant nails, use a crystal (metal) or glass nail file. It kind of angers me that my “freebie” from a nail polish company that knows about nail care would give me an emery board when I’m paying $20 a month. You can buy these at Walgreens for less than 50 cents! Not impressed Julep, especially when I read other blogs and know that you have glass nail files included in other boxes. Charlotte. Charlotte is a medium toned purple creme. I love this color! I love the tone, I love how it looks on my skin tone, I love that I don’t own anything close to this and I love how it applies. This is 1 coat! 1 coat!! ‘Nough said. Jodie. Jodie is a pink/red/rose color with a strong copper tone to it. I wish I could think of an easier way to describe this color, but I can’t. I hate this color. This is a personal preference for me, I just feel like this color is old looking and I really don’t like the finish. 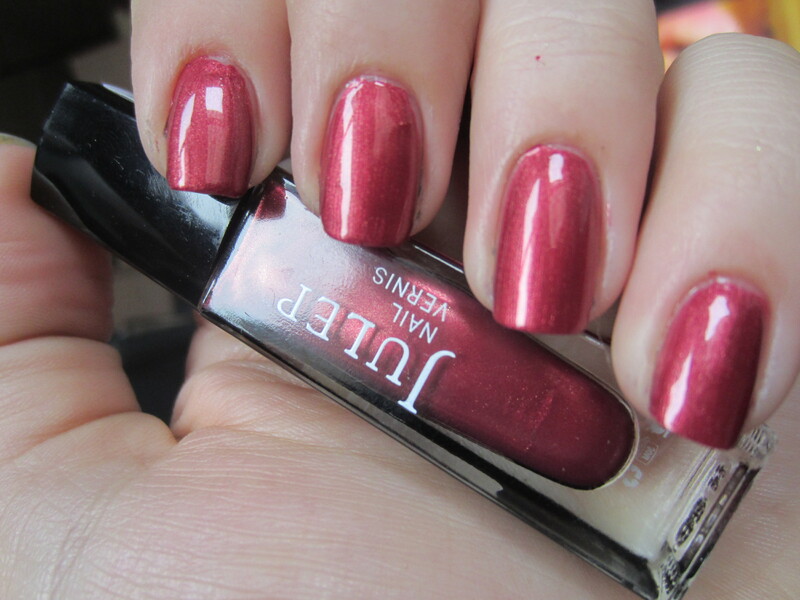 The metallic finish with the old-lady looking color just makes this the least favorite color I’ve ever gotten from Julep. And this was 3 coats. Not cool at all. It’s not my type of color and then I needed a ton of coats to reach opacity. Melissa. 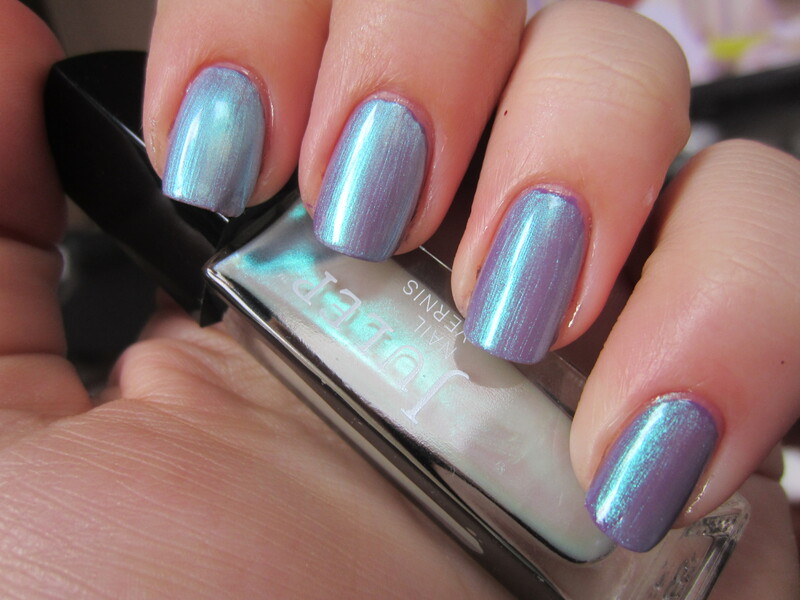 Melissa is a sheer duochrome that changes from white to BRIGHT teal. 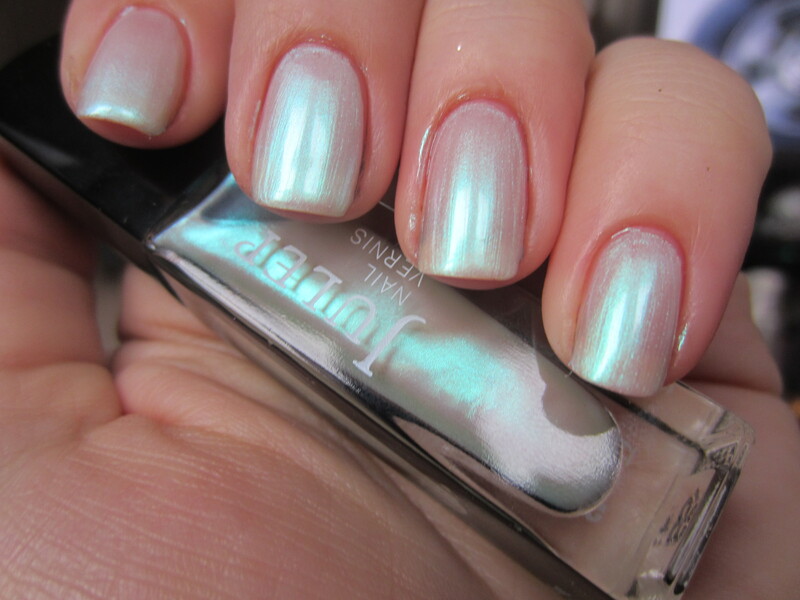 I wish my camera caught how bright this color is when it shimmers teal. This was specifically sold as an overcoat. Its not meant to be worn on its own, but this is 4 coats on its own here and there is still visible nail line. 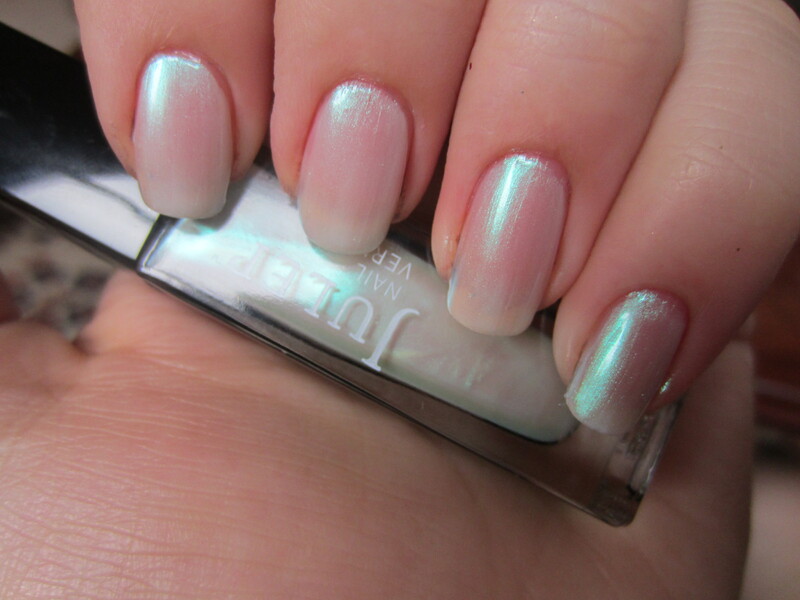 This picture shows my nail line better and that’s how the polish looks when the teal shimmer isn’t visible. 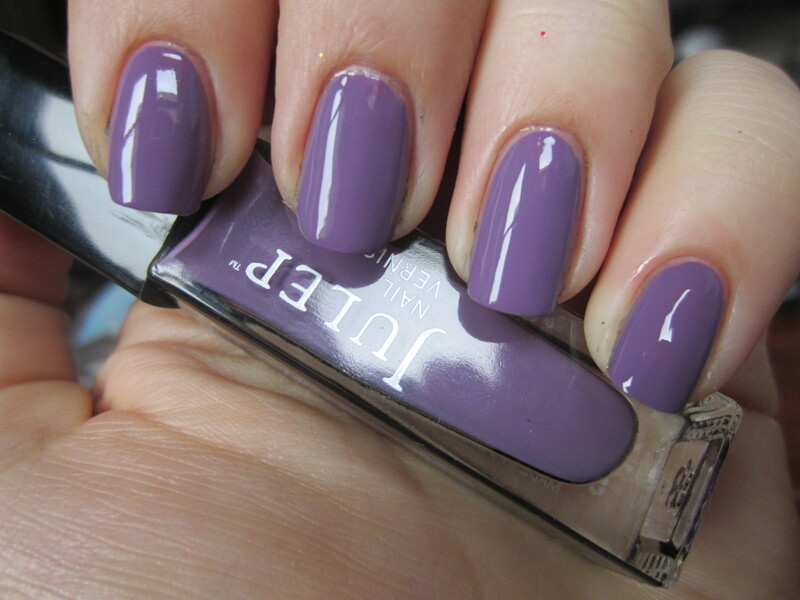 So I wanted to try this color as an overcoat over the 2 other polishes Julep sent me. I think Melissa over Jodie looked awful! But what do you expect putting opposite colors together. Pairing a teal shimmer over a rose-copper. Those are pretty much exactly opposite each on the color wheel so I knew I wasn’t going to like it. Melissa over Charlotte is better but I think Melissa would look better over a blue or green, or maybe even a darker color. You can see streaks and also where Melissa isn’t completely covering Charlotte (like near the cuticle) its very apparent that there’s a lighter color over top. 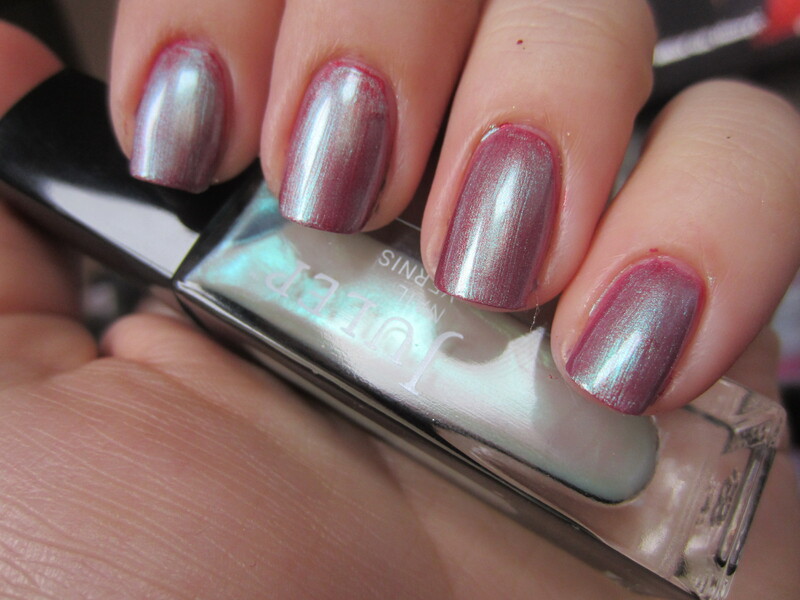 I was hoping for something that is more sheer for an overcoat, like the CND over coats, where it just transforms any manicure into an awesome duochrome that looks like 1 polish and not a layering experiment. Overall, I wanted to love Melissa but I only like it for the concept. I feel like that polish is going to be my next China Glaze “Snow Globe”, love the concept and always break it out to force it to work but can never make it look good. Charlotte so my new love! Its up there with Julep Emilie as one of my favorites that I ever got from Julep. And Jodie is god awful! And who sends an emery board!?! Not impressed this month, but I already know what I’m getting for April (5 polishes plus extras for $30) so we will see if I stick with Julep. Last time I thought about cancelling they blew me away for 2 months. Maybe they’ll be stepping up their game. ← My Hunger Games Manicure!